DEFINITION: Trademark for a fabric of spun rayon, often woven to resemble linen. Her trophy gathers dust in her parents' attic. Her husband's a pretty good speller, but that doesn't matter. 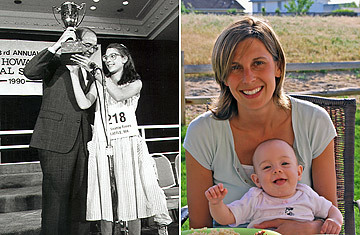 Dimak was in eighth grade when she won the 1990 National Spelling Bee. "It's something I've been very proud of, but when I won, I was really embarrassed. I still get shy when a friend blurts it out to a group of people. It's sunk in, but it still hasn't sunk in." As a parochial school kid representing the Seattle Times, she says, "Other kids were out playing baseball while I went back into the school to study. I remember complaining about that." But she has fond memories of the trip with her parents to Washington, sight-seeing, barbecue, and volleyball. "I remember it raining quite a bit. The two sunny days, we were inside spelling." "I needed a confidence booster," she says of taking the championship. "I had big glasses and braces. Winning made me feel I could do anything. "She never experienced an ounce of jealousy from friends back home, who met her plane, nor did she automatically veer into a literary major at college. "English wasn't my knack. It didn't come naturally to me. But I've always had a fascination with how things work in the body. I graduated in biochemistry."